The first town in this game is all tutorial, with many tutorials that appear as the game continues so this guide will not cover those aspects. Please note that the tips and tricks I put in here are what I did during game play. I'm sure there are other ways to play but the fun is figuring it out on your own. I hope these suggestions will help you if you get stuck. 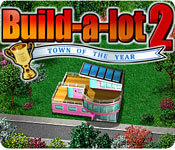 If you are familiar with the first Build-a-lot game, you will see that the game play is almost identical with a few new changes and some old omissions. The first game contained only "Houses" and "Buildings." This game also has "Shops" and "Parks"
Location appeal has been replaced with "Curb Appeal" (represented as "approval ratings") so now, depending on how you build, any spot you build on has the potential of being a "prime location." Shops and Buildings can greatly add to your income but can drastically reduce your overall approval rating. Certain structures you build will also affect the property around it. There are two additional options when buying a house: "Offer Less" and "Low Ball." These options are only available if there is more than one house up for sale or more than one of the SAME type of house for sale. Unfortunately, I never had the chance to use either function but I did find a way to use them to my advantage (more on that later). You can now paint your houses to increase approval. Houses still need periodic repairs (until you unlock the option to inspect them later in the game) and now, the parks you build need cleaning from time to time and your shops will demand another worker from time to time. Failure to do these things drastically lowers your approval rating and affects the surrounding building/structures as well. Shops periodically generate revenue (just like banks did) but they can give a LOT more $$ than the banks ever did! Workshop - Same as the first game: this allows you to hire and train workers faster and for less $$. Different: Later in the game (starting at level 19), you can spend $75,000 on "Efficiency Training" to make your workers go faster. This is an important and useful upgrade! (IMHO) Approval Rating: -5 Affects properties next to it. Recycle Center - Provides the same function as the Lumber Mill in the first game (I guess everyone is going "green" these days!) Approval Rating: -5 Affects properties next to it. Garden Center - Building a Garden Center allows you to landscape your houses and adds a +5 to your house's rating every time you do it. Approval Rating: -10 Affects properties next to it. NOTE: Later in the game, having a garden center will stop you from having to clean your parks! Business Center - This takes care of your shop workers. You won't have to assign them from your own pool of workers and you won't have to worry about your shops lowering your approval rating. Approval Rating: -15 Affects properties next to it. Refinery - Oil refineries drastically lower approval ratings but periodically give you checks for anywhere from $20,000 - $78,000!! Note: $78,000 was the highest check I gotâ€¦ It could go higher though. I just never saw it. Periodically throughout the game (beginning at level 22), a neon "Help Wanted" sign will appear on your shops (unless you have a commerce center). When this happens, your shop will radiate negative appeal that affects the surrounding buildings, or houses. When this happened, you need to assign one of your workers to that shop by clicking on the shop and clicking "assign worker." This will cause you to lose one worker. Periodically throughout the game (beginning at level 24) a broom and dustpan will appear on your parks, drastically lowering the surrounding approval ratings. You must click on them to clean. Eventually, (beginning at level 27) having the Garden Center built will automatically take care of that for you. IMPORTANT! Take a few seconds to ~look~ at your town's layout and try to plan ahead! Breaks in the land plots that group 2 or 3 lots together can be VERY useful for either grouping negative approval structures together or building two houses with a park in the middle. Grouping negative approval structures together will NOT compound or multiply its negative ratings! Depending on the layout, I sometimes use a shop as a "buffer" between negatively rated structures and my houses. Shops aren't affected by negative or positive ratings but will absorb the negative rating that would affect a house if it were built there instead. If you don't like the way your town is laid out in the beginning, simply restart the level until you see a strategically optimized layout that you like best. Paint EVERY house you build regardless of whether you keep it or sell it! The approval rating you earn will stay with the house and add to your overall rating even if you don't own it! Beginning at Level 11, you will start to get "surprise" requirements. That's when the Mayor of the town interrupts you when you're almost done and gives you another requirement to do in order to win. For me, this usually meant that I'd have to replay that level and prepare for it in advance. I will list some of those surprises in later levels in case you are interested in knowing but to me, that was part of the fun and makes the game last longer. Always check the mail. You don't need to build a post office this time around. The mail will arrive automatically. Always open in because it usually contains some extra money and sometimes will remind you of a useful gameplay tip. While it's nice to be able to paint the houses different colors (and some levels require specific colors) the easiest color to paint a hose is YELLOW because it's just underneath the "Paint House" button so you can essentially double-click on "Paint House" to shave off a few seconds. If there's a house you REALLY need to buy and you're worried it will be removed from the market before you can buy it, you can "squat" on it. Just click on it and leave it highlighted until you get enough from your rental propertied to buy it! This can be a BIG time waster though but as long as you leave the house highlighted, it won't go off the market! The ONLY use I got from the "Low Ball" or "offer less" buttons were when a house or property popped up that ~knew~ I needed but couldn't afford in a while. I clicked those buttons and while my offer was refused, the house went off the market right away. That way, I knew it would come up again at just about the right time when I needed it! Level 35 - There are no hidden surprises on this one but it can be tricky! You need to have 1) No empty lots, 2) All houses with a +10 Approval rating, 3) $10,000,000 in cash and 4) Rent = $500,000 The key to this level is to build all palaces; have a workshop, recycle center and garden center; and paint and landscape every property! Also, stock up on workers and lumber and upgrade and inspect as you can. At the very end, make sure you have enough materials, then demolish your 3 buildings and simultaneously build 2 palaces with a GRAND park in the middle. You won't need to paint or landscape because the park takes care of that and you will have met all the other requirements by then. Once you complete all levels, you get to vote for your favorite town. Once you do that, you'll unlock a BONUS LEVEL for that town! NOTE: Once you complete the bonus level, you'll unlock a bonus level for EVERY TOWN and unlock the ability to go back and re-try any level you want to try to get all expert scores. Summerville - 1 Refinery, $5,000,000 cash and a +30 Appeal - I grouped the utility buildings together and made sure I had my lots arranged so I could build 2 SETS of 2 Palaces each with a Grand Park in the middle. This offset the negative effects of the buildings and refinery. Willowsburgh - This one is Tricky. It initially states that the goal is simply to raise $5,000,000 but as soon as the timer reaches the spot where you can no longer get an "Expert" score, the mayor tells you that in addition to raising $5,000,000 you need to have ALL EMPTY LOTS, which means you'll have to buy all the property too. I just started building palaces and buying every house as it came up, then I destroyed them when they got damaged and replaced them with palaces and upgraded them. As soon as I got close to $5 million, I started knocking down palaces. As soon as I hit $5 mill, I went on a destruction frenzy!! NOTE: Destroy your workshop LAST! That way your workers will go fast until the very end! Calico Crossing - 6 Refineries, 1 three-star Modern, (Surprise extra requirement - a +5 Approval Rating) Hint: Build Grand Parks!! !